The weekend brought with it the season’s first snowfall, to the sheer delight of the lady fair. Nothing can be more magical than waking to a world trimmed all in white and shimmer. Flakes fell thickly, and we delighted in catching the icy bits on our tongues, while it caught us on our faces and tangled all into lashes before vanishing away again.
. . . always willing to share her treats with others – especially when it falls from the sky like manna! Where we live, winter’s first snow seems only to last for a moment. . . we got from it what we knew we could in the fleeting time before the thaw. One icy weekend will have to be enough until we are visited again. The traditional and tiny first-snow-man stands guard over our house, warning all who pass that Silly lives here. . .
Made on the afternoon of the second day, we loved him for little over an hour until his blueberry buttons began to fall, one by one onto the noon-baked pavement. He stands still, more or less, a single arm and a scarf on a brave little heap of slush and holly – refreezing in this midnight hour. By Monday afternoon he will have melted all away – along with our weekend fun. 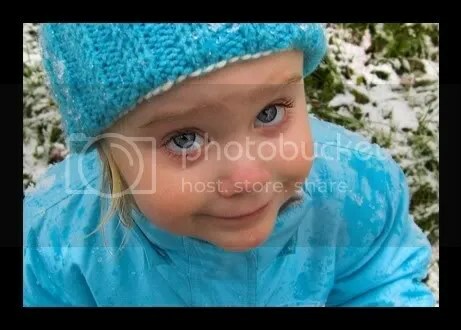 . .
A very confused baby-Puff is pictured below trying to figure out what exactly is going on. . .these images are from the first snow that fell during her tiny little lifetime. She wasn’t so very sure about it. This season marks the Wee Puffy One’s THIRD first snow. This time, she had been awaiting the event for weeks. That is completely adorable!!! 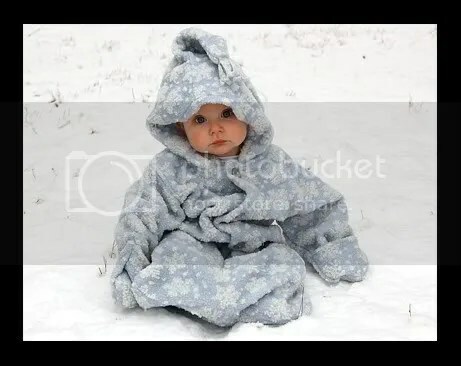 I remember those pictures from her first snow fall and this year definately rivals those! 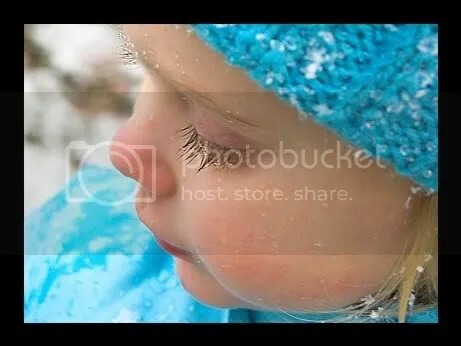 I love the eyelash snowflake picture. Priceless! My girls were yelling, in the back of the van, “NO MORE SNOW!” I have no idea where they got that because…well, duh, we live in Florida and there IS no snow here. It’s illegal, I believe, because for the total of 7-ish years that I’ve lived in Florida, I have never seen snow here! Such great photos. Your snowman seemed to have faired better than ours. Mark and Tori’s snowman fell before I could even see him. Maybe they need a good lesson on how to make good snowmen. Aw, that was a good try! Better first snowman than I’ve ever made, I’m sure! “…we loved him for little over an hour…” I love that line. I hope that, for all our sakes, it snows again soon. Tiny snowman is too cute!! I LOVE HIm!! Baby Puff is growing up so quickly. You could send a little snow our way! 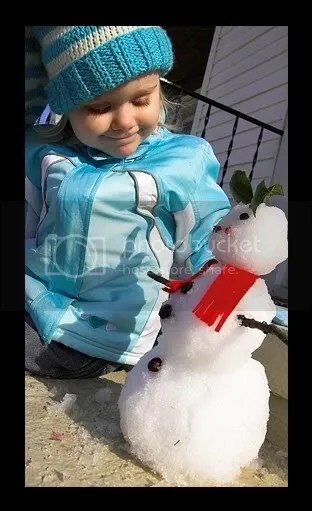 Loving a Puff and her snowman–too cute for words! We’ve also been dumped with some snow. 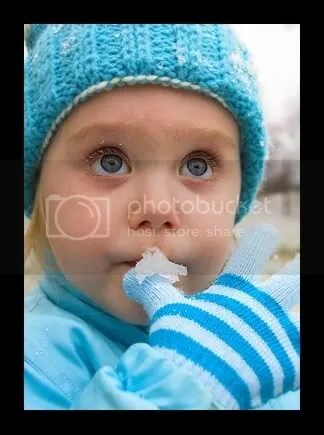 Great Shots….We didn’t get to see real snow here yet…had a thin layed a week ago but no use……I love the last year’s pictures…..
T is so beautiful in aqua/turquoise. It’s a perfect color for her snow jacket, hat, and blonde hair. I didn’t realize T had such gorgeous eyelashes… great shot! ‘…warning all who pass that Silly lives here.’ I love that. Those last two baby shots are just so adorably babyish. T-ball sure has grown, she’s come a long way in one year. 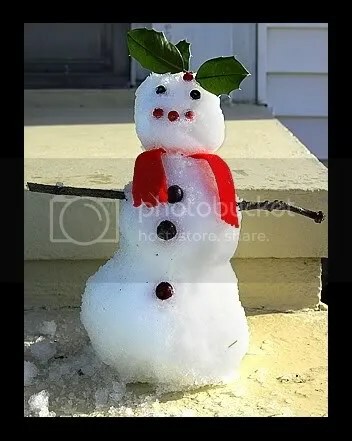 Love the holly on the snowman’s head. That’s very clever. And those eyes on your Puff…. drop dead melting right there. My youngest has those, and her siblings are lovingly jealous.